Nothing is ever perfect, and even when it appears to be so, we are subconsciously looking for the flaw. Because our point of connection lies in imperfection–it’s what makes something authentic. And now, since perfection can be had at the stroke of a digital brush, we have an increasing need to know what’s real. We’ve seen and heard this commercial a thousand times, the one with the flawless model posing in an ad for facial-blemish cream… an extremely powerful cleaner that removes every trace of dirt in one effortless wipe… the picture-perfect baby modeling the 100% waterproof diaper. In these scenarios, there’s not even a hint of a single red spot, a stubborn stain, or a bedraggled mother. This is the story of the past 50 years of commercials, and they all have one thing in common: perfect brands in perfect environments. But there is a strong case to be made for imperfection. Nothing is ever perfect, and even when it appears to be so, we are subconsciously looking for the flaw. Because our point of connection lies in imperfection–it’s what makes something unique and, ultimately, authentic. Since perfection can now be had at the stroke of a digital brush, and the food we eat can be manipulated to look brighter and fresher, rounder, and yes, perfect, we have an increasing need to know what’s real. Let me share a story about what happens when a brand does give in to imperfection. Some months ago a major European cosmetic brand was forced to cut costs. They were not alone, but the only way they could do this was by reducing the length of their TV commercials. They decided to cut their regular 90-second spots down to 30 seconds. The big dilemma they faced was about which scenes to cut out. Instead of taking the conventional route–opinions and guesswork–they used a neuro-scientific tool based on EEGs whereby brainwaves of consumers were measured and evaluated. By scientifically analyzing the commercials they were able to assess which scenes were the most emotionally engaging. To everyone’s surprise, one scene–the one all the senior executives wanted to cut out–showed to be the most powerful of them all. It was a scene in which two ladies were huddled close, with one touching the other’s cheek as she was crying. For want of a more diplomatic description, the client referred to it as “the lesbian scene.” Whether it was the notion of lesbians or crying women, the prevailing thought the client had was that this particular scene would negatively affect their brand. But based on the EEG results, the 30-second commercial was cut and tested. To everyone’s surprise it showed that not only were consumers substantially more emotionally engaged, but when asked to pick a product in a simulated retail store, they ended up ‘buying’ 35% more of the brand. Consumers embraced what advertisers were scared would not be perfect enough for them. In fact you may very well recognize the commercial–it’s still running. When you stroll down the aisles of a supermarket, every product stacked on the shelves–from bread to bath salts–features perfect pictures of the perfect fruit or the perfect smile or the perfect cookie. But if you ask customers about the criteria they want their products to have, more and more will say they’re looking for a product that’s authentic. The thought of gigantic factories churning out millions of cookies, or food being injected with additives that boost the ‘natural’ color or enhance the aroma, or irradiation processes that keep old fruit looking new–well, all these sophisticated processes just seem to generate feelings of enormous distaste and even horror in the minds of consumers. I recently visited Trader Joe’s where the luxury chocolate Ghirardelli was on sale. Ghirardelli was selling “bulk” chocolate chunks packed in large brown paper bags branded with old-fashioned handwriting. The bag contained hand-made chocolates cut into uneven pieces–some large, some very large and some tiny bits. There was no doubt that this looked as fresh and authentic as it could be –until I happened to buy two bags and coincidently discovered that all the uneven, hand- cut pieces had a perfectly matched partner in the second bag. The broken chunks were no accident at all but were molded to look like random broken pieces. There was a very clear plan to appear home-made, and for a while, I believed it…and bought it. Studies show that the people we relate to best are those who we perceive share our weaknesses–those who mirror, or at least seem capable of mirroring the mistakes we tend to make. Take for example the most watched videos on YouTube. Are they perfect? Hardly. Most are by amateurs whose work looks amateurish. We watch reality shows on television, and despite all predictions that they’re on their way out, reality shows keep inventing ever-new situations (Jersey Shore, anyone?). Regardless of such evidence, brands continue in their quest to present only the perfect, because it’s quite simply not in the vernacular of advertising culture to really tell it like it is. Please don’t misunderstand me. I’m not asking the ad agencies to focus on the negative aspects of a brand. What I’m suggesting is to show how life really looks. Babies do not stay clean when eating their pureed food, and apples are never all the exact shape and size and color. Messages portraying perfection are not trustworthy. No one actually believes them. We don’t believe candidates applying for jobs who claim they do everything perfectly. We don’t believe the person we sit beside at a dinner party who tells us everything in their life is just perfect. So why should we believe in perfect brands? We don’t. So it’s about time advertising changes their tune and strives for a little imperfection. 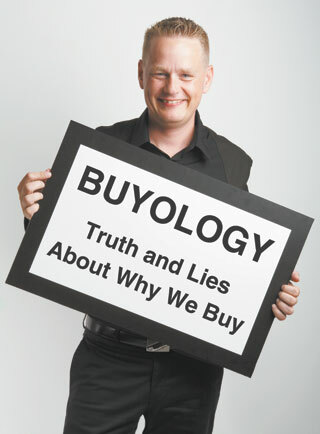 MARTIN LINDSTROM is a 2009 recipient of TIME Magazine‘s “World’s 100 Most Influential People” and author of Buyology – Truth and Lies About Why We Buy (Doubleday, New York), a New York Times and Wall Street Journal bestseller. Lindstrom is the CEO and Chairman of LINDSTROM Company and Chairman of BUYOLOGY INC. (New York and Tokyo) as well as BRAND sense Agency (London).